Today AIMCo announced that it is investing $500 million in an American company called Howard Energy Partners. AIMCo is an Alberta crown corporation that manages money for government pensions and endowments. They have $90 billion under management. Virtually all of that money is derived from taxation. What does Howard Energy Partners do? Alberta can’t get pipelines, in part because it is viciously opposed by US-backed opponents. Meanwhile, the US continues building pipelines — lots of pipelines — and even has the pleasure of getting Alberta taxpayer money invested in its own pipeline companies. Members of Notley’s NDP government are global warming radicals. Remember that the global warming movement is not actually about science and global warming, which is why global warming fanatics disregard the mountain of evidence that refutes them. Global warming activists slavishly cling to junk science because they yearn for power where lawmakers, bureaucrats, and crony capitalists who favor socialism can gain control over the economy. First it asks you whether you are worried about climate change. 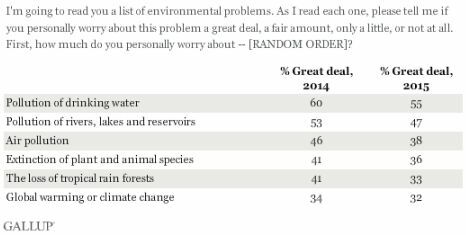 Well, despite all the chatter about it, no one really seems to be all that concerned about climate change to be honest. They care about it less and less with each year, and it’s at the bottom of their list when it comes to environmental issues. The world’s climate has changed at an unprecedented rate since the 1950s. Increasing concentration of greenhouse gases have warmed the atmosphere, diminishing snow and ice, warming oceans, raising sea levels, and causing more extreme weather, such as floods and droughts. We can also see its effects locally through impacts such as the spread of the mountain pine beetle. Scientific evidence tells us that – without significant action on a global scale – the consequences of climate change will be severe. Even if all of this were true (it isn’t; global warming exists only in the minds of charlatans and cranks), it doesn’t follow that we can or should use the government to do anything about it. So the survey basically starts off with a big non sequitur and by lying to the respondent . In advance of the conference, the Government of Canada has proposed a commitment to reduce greenhouse gas emissions to 30 per cent below 2005 levels by 2030. While Alberta’s energy-based economy helps fuel economic growth across Canada, we also account for approximately 37 per cent of Canada’s total emissions. The reputational impact of Canada’s action on climate change is likely to fall heavily on our province, which has already drawn domestic and international criticism. This is really awful. The NDP is telling us that we should ravage the economy for the sake of our reputation among contemptuous and ignorant people — within and without Canada — who might not like us because we burn a lot of fossil fuels while we recover even more fossil fuels, supporting humanity with cheap energy which makes the modern world’s economy possible at all. At the same time, some people seeking power in the next federal election want to prevent Alberta from mining tar sands and burning fossil fuels in the process. Slight detour: Regardless of any commitment Ottawa makes, there is no real constitutional authority for the federal government to interfere with a province’s resource development. The 1982 Amendments to the Constitution Act explicitly state the that the provinces have exclusive jurisdiction over their non-renewable natural resources. Of course, as always with these matters, there are some loopholes. The federal government has jurisdiction over “local Works and Undertakings declared by the Parliament of Canada to be for the Advantage of two or more of the Provinces.” That’s a problem. Plus, we had the National Energy Program regardless of any constitutional division of powers. So the Constitution Act doesn’t seem to be worth a damn. On the other hand, provincial governments have the constitutional right to do anything they want regarding the resources in their territories. In December 2015, the United Nations is hosting the Conference of Parties in Paris. The desired outcome is to create a binding treaty that will commit all nations to significantly reduce their greenhouse gas emissions. This is completely Irrelevant. These treaties never go anywhere. No one cares about them. There are no sanctions. The governments of the world never bothered to implement the Kyoto treaty of 1992 or its update in 1997. It lapsed on with the end of 2012. Game over. No one cares. Alberta’s energy economy depends on its ability to reach – and sell – our resources in markets throughout North America and around the world. These markets are increasingly demanding cleaner forms of energy. If we don’t take action on climate change locally, Alberta will find itself increasingly isolated and shut out of markets. This is just wrong and sneakily misleading. When it comes to the environmental issue, opposition to the pipeline infrastructure stems from people, rightly or wrongly, being afraid of toxic substances flowing through the country in pipelines with the potential to leak out or spill and poison everything around them and kill everybody. It has nothing to do with climate change! Alberta can implement all the climate change policies it wants, but people will still have rational and irrational concerns about pipelines. Alberta’s efforts to access new markets for its products will not at all be helped by its abusive government’s bigger, badder climate change policies. From there, the various agree/disagree questions reveal all the dream policies of the NDP. Question #14 is where it becomes obvious that they don’t care about your opinion. These are the things the NDP wants and it’s going to do them. Now, thinking about the options discussed above, please rank them by priority with the highest being the action you would most like to see taken. Drag the choices into your preferred order, or use the arrow buttons to move the options up or down. So it asks you to rank a bunch of terrible policies that all belong in the “evil and uneconomical” category: an exploitative interprovincial cap n’ trade system, increasing taxes on industrial companies that burn fossil fuels, increasing subsidies to companies with political connections, increasing taxes on everyone, and subsidizing middle and upper class people who own buildings and houses. Subsidizing homeowners (which tend to be middle or upper class people) with ‘incentives’ and grants (theoretically, incentives could include reducing taxes and regulations on more energy efficient technology — but who are we kidding? This is the NDP). Subsidizing and protecting politically favored renewable energy producers. Literally killing (or “phasing out,” as the NDP likes to say) an industry that some people don’t like. Don’t you love when the government decides who will be in business and who won’t be? This is all quite terrifying. This tells us what the NDP wants. They just want to beat us over the head with fake survey results in a pathetic attempt to justify their destructive policies. If you want bureaucratic control over the economy, inefficiency, unemployment, and impoverishment, you should support the NDP’s climate change policy. If you want to subsidize India and China, where they don’t care about the bureaucratic rules and regulatory systems in Alberta, then you should support the NDP’s climate change policies. If you want to get less energy and pay more for everything, then support the NDP’s climate policies. If you are a good person, you should oppose them. I knew I smelled a rat when Notley’s NDP chose ATB President and CEO Dave Mowat to head the royalty review board. In a process that will surely revolve around “fairness” and other uneconomic nonsense, why would the NDP pick a banker of all things to head the review? Hmm, do you think his thinking might be a bit clouded by Algore’s lies? I know Algore created the internet with his bare hands and all that, but did he invent a way to break the laws of space-time too? This is total nonsense — climate change propaganda at its worst. Can Dave Mowat explain this magical graph? Was that part of his propaganda training with Algore? Heck, the famous Algore graph shows CO2 increases preceding the temperature rise. You fail automatically at science if you observe that A precedes B and therefore conclude that B causes A.
Algore is a shameless liar and anyone trained to spread his lies should not be running a royalty review for Alberta’s oil industry. It’s seems fair enough to say that Dave Mowat is biased. So he is the perfect guy to push the NDP’s agenda. A large number of people have been asking me about the price of oil and what it means for the economy. Rather than just repeating myself all the time, I am writing this article. I feel it is important to clarify how the law of supply and demand works, because I hear a lot of incorrect analysis from people who should know better. If you understand the law of supply and demand, I recommend that you skip to the next section. This proposition is completely wrong. 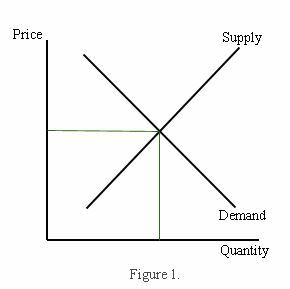 Let me show you an ordinary supply and demand graph, like anything you will see in an introductory economics textbook. The x-axis is quantity, and the y-axis is price. The intersection of the demand curve and the supply curve is where the market clears — everyone can buy the amount they want to buy, and everyone can sell the amount they want to sell. Simple enough. Now consider the following graph, which depicts a change in demand. Specifically, it shows an increase — the demand curve shifts to the right (D1 to D2). What is happening here? Demand has increased, and the price goes up. What is not happening here? The increase was not caused by a lower price — instead, it caused an increase in the price. The rise in demand is the cause, the rise in price is the effect. We know for a fact that the price of oil has fallen dramatically in the second half of 2014. Why? Reduced demand, increased supply, or both? Much of the world is in economic trouble. China is slowing. Japan is a mess. Europe is a disaster. When much of the world is in recession or heading for recession, we expect the demand for oil to fall. And even in the US, where the economy is stronger, oil consumption has fallen 8% since 2010 (there are many reasons for this, but I will not go into it here). So falling demand is a reasonable explanation for the fall in oil prices. There is also the issue of increasing supply. OPEC is still pumping, business as usual, even though the price is down. Shale oil producers have been producing in a frenzy. There is a greater supply of oil. 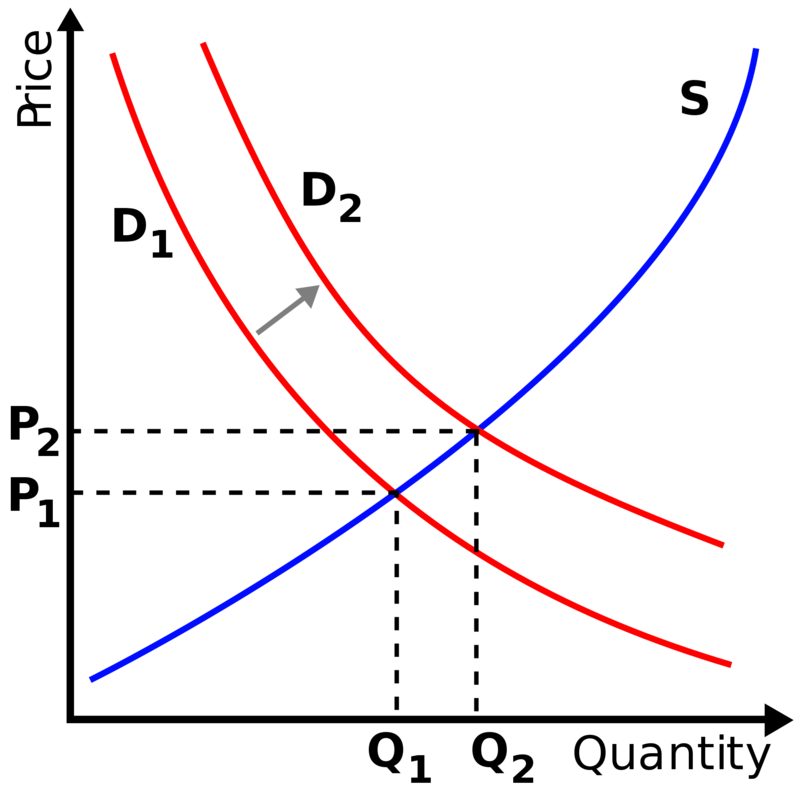 The graph shows an increase in supply (the supply curve has shifted to the right). The market clears at a lower price. Less supply (S1) has become more supply (S2). The quantity demanded goes from Q1 to Q2. The price of oil has been falling in the second half of 2014. It fell very fast. Supplies have not increased much since June. This makes me believe that falling demand is the primary cause in this situation. Now let’s look at a situation where there is “inelastic” supply (meaning it is not very responsive to price) and a fall in demand. This is an extremely “non-price-sensitive” supply. The Saudi head of oil production has proclaimed that they will keep pumping even if the price drops to $20 a barrel. The other producers need money, so they will keep pumping. They cannot trim production and influence the price. The Saudis have considerable influence in on the supply-side of the market. That’s why the supply is inelastic. Let’s return to the initial proposition we considered: the oil price is lower, so there will be increased demand for oil. This is bad analysis. Part of the problem is in the fact that “demand” and “quantity demanded” are often used interchangeably. But essentially it is mixing up the issue in the first and second graphs. The price of oil is down. The supply has increased. The demand has not increased — the quantity demanded at the new price is greater than at the higher price. This is not the same as saying a lower price of oil will increase the demand for oil. An increase in demand would — in the language of economics — imply a rightward shift of the entire demand curve. 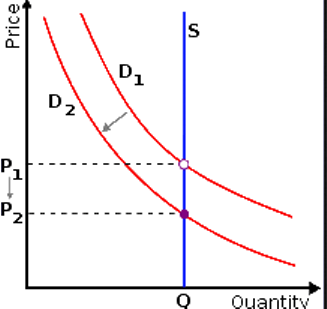 A falling price does not increase demand, it increased quantity demanded. These things sound similar, but they are analytically different and this is important to understand at an elementary level. 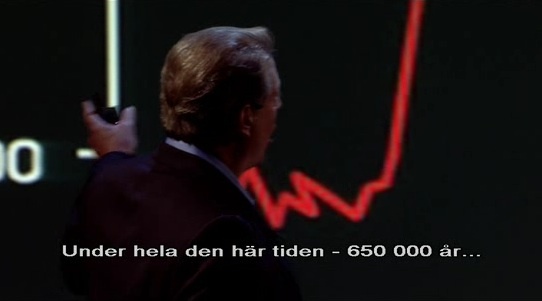 Now with that boring stuff out of the way, let us look at the current situation with the price of oil and the economy. I regularly speak with a lot of presidents and CEOs in the Alberta oil industry. A commonplace view is that price collapse is all the result of the Saudis pushing down the price of oil because [insert reasons here]. There are some amusing conspiracy theories floating around as well, particularly that which avers the US and its Saudi allies are manipulating the oil price to drive down the price of oil to hurt some evil countries, like Russia (America’s archenemy) and Iran (Saudi Arabia’s archenemy). Realistically, how much of the blame rests on the Saudis? Maybe some, sure. But I don’t think it’s that much. After all, how much does Saudi Arabia have to do with the price of steel, coal, and iron ore? How much do the Saudis influence the price of copper (which, by the way, is almost as much of a barometer for the world economy as oil)? We see that oil is not the only commodity with a collapsing price. Maybe instead of market manipulation, it’s a sign that the global economy is not as strong as everyone had hoped. The distortion in commodity prices are the result of central banks collectively expanding their balance sheets from $5 trillion to $16 trillion in the last 10 years. We also need to think about think about China, which has driven a great deal of the marginal demand for commodities in the last several cycles. China went from $1 trillion GDP to $9 trillion GDP in 13 years — an insane growth level that would be impossible but for printing press finance. The incredible Keynesian-mercantilism started by Deng in the early 90s resulted in China’s demand for oil quadrupling from 3 million barrels per day to 12 million per day. Before then, the $20 price for a barrel of oil was, all things considered, was pretty much the same as it was 100 years when adjusted for inflation. Which makes sense given the basic balance of harder-to-get oil and improving technological methods over time. The story is the same elsewhere. In the crackup boom phase of the cycle, iron ore prices hit 9x their historic range at the peak, and copper prices hit 5x their historic range. As with the other industrial commodities, there has been massive investment in petroleum production to feed the world’s unsustainable growth projections. Huge scale undertakings in the Canadian oil sands, US shale, and various deep-sea drilling projects, driven by these consumption forecasts and cheap credit, have resulted in major production increases. The bubble finance hype machine over the “Fracking revolution” in US shale led to a 4x increase in oil production with wells that would be uneconomical in a sane world. So now there is too much oil production and not enough demand. The market needs to normalize, and that means the price of oil (and other commodities) needs to fall so sanity can be restored. US shale in particular is a nasty bubble — the next “subprime” crisis. North Dakota needs an oil price of around $55 per barrel at the wellhead and a fleet of about 140 rigs to sustain production at the current level of 1.2 million barrels per day, the U.S. state’s chief regulator told legislators on Thursday. . . . Breakeven rates for new wells, the level at which all drilling would cease, range from $29 in Dunn county and $30 in McKenzie to $36 in Williams and $41 in Mountrail. These four counties account for 90 percent of the drilling in the state. Even before prices hit these minimum levels, drilling will slow sharply. The number of rigs operating in the state has already fallen to 165, down from 191 in October, according to the department. . . . Unlike conventional projects, shale wells enjoy an extremely short life. In the Bakken region straddling Montana and North Dakota, a well that starts out pumping 1,000 barrels a day will decline to just 280 barrels by the start of year two, a shrinkage of 72%. By the beginning of year three, more than half the reserves of that well will be depleted, and annual production will fall to a trickle. To generate constant or increasing revenue, producers need to constantly drill new wells, since their existing wells span a mere half-life by industry standards. On average, the “all-in,” breakeven cost for U.S. hydraulic shale is $65 per barrel, according to a study by Rystad Energy and Morgan Stanley Commodity Research. So, with the current price at $48, the industry is under siege. To be sure, the frackers will continue to operate older wells so long as they generate revenues in excess of their variable costs. But the older wells–unlike those in the Middle East or the North Sea–produce only tiny quantities. To keep the boom going, the shale gang must keep doing what they’ve been doing to thrive; they need to drill many, many new wells. Right now, all signs are pointing to retreat. The count of rotary rigs in use–a proxy for new drilling–has fallen from 1,930 to 1,881 since October, after soaring during most of 2014. Continental Resources, a major force in shale, has announced that it will lower its drilling budget by 40% in 2015. Because of the constant need to drill, frackers are always raising more and more money by selling equity, securing bank loans, and selling junk bonds. Many are already heavily indebted. It’s unclear if banks and investors will keep the capital flowing at these prices. I think long-term Canadian oil sand projects will have a stronger future, because they have more fundamental validity and less bubble finance hype (although there is some of that, of course). And while it it doesn’t seem like it to individual market participants, prices ultimately determine costs and so lower prices will push costs down. Rates of return in the market tend to equalize across different industries — there is not legitimate reason why people should forever expect above-market wages and investment returns in the oil business. Because I believe the Austrian business cycle theory is correct, I think China’s tightening of monetary policy has been a major factor here. Likewise the Federal Reserve, with its 7x increase in the size of its balance sheet, culminating with a “taper” and proceeding into deflation mode following the end of QE3. That’s right, deflation mode. They did not just “taper” the rate of growth on the monetary base then hold it steady. The Fed actually sold off 10% of its assets starting in September before jumping back into open market operations with $250 billion in purchases. This kind of behavior is very disorienting for the market, with capital markets adjusting to money being sucked out and then pumped back in. 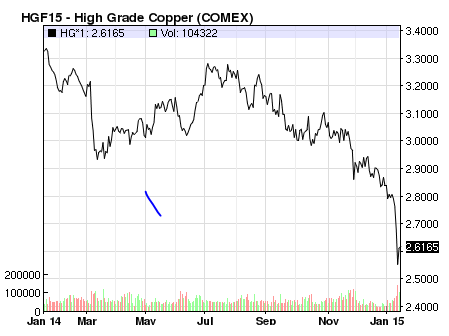 But it helps explain the strengthening of the USD and the bloodshed in the commodities markets. Then on Jan 15 came the Swiss National Bank’s surprise decision to end its foolhardy 1.20 EUR peg before Drahgi opened the ECB money floodgates. 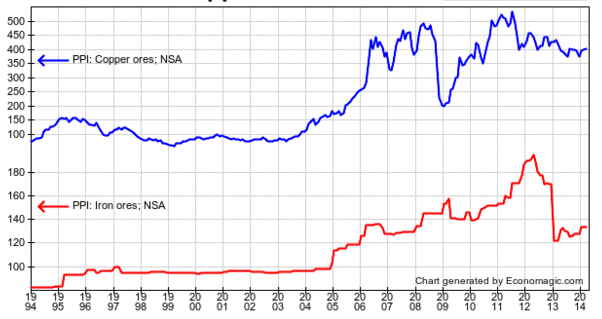 In its Keynesian desperation to diminish CHF purchasing power, the SNB’s balance sheet increased fivefold since the financial crisis and it amassed assets equal to 100% of the nation’s GDP — which is even more extreme than the insane BOJ, if you can believe it. With this development, the franc soared against the Euro and the US dollar and baffled everyone, even destroying a couple of FX firms overnight in one fell swoop. Things will get crazy as some central banks tighten and others keep printing. These currency dislocations could lead to a currency crisis somewhere, but that is hard to predict. In any case, the insanity meter is in the red. Gold and oil often move together. And when the US dollar strengthens, gold usually weakens. But we are not really seeing this. 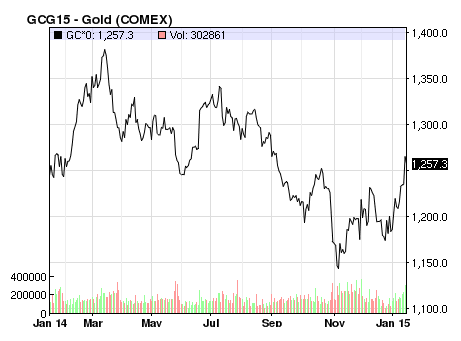 Gold has been quite resilient amidst falling commodity prices and is performing well so far in 2015. In this case, I’m not entirely sure what this means. On the one hand, it could indicate that a recession is less likely. On the other hand, it could indicate that investors are worried and are hedging against danger, like more aggressive central bank interventions. The “correction” is healthy. It means reallocating resources to their most economical use. But it is painful — like a heroin addict going into detox. It would be good for the world if oil went down to $20 a barrel and stayed there for 20 years, but I think the “peak oil” thesis is basically correct, and prices will rise again. We might not see a radical swing like in the 2008 crash, where we went from $37 back to $80 within the year. The timing for all this depends on what happens in the recovery phase. Major readjustments need to occur. These adjustments could be brutal and quick, and the economy could resume a healthy course within a year, so long as the myriad governments take a “laissez-faire” approach. If governments impair economic adjustment with more taxes, spending, and inflation, we’ll just get a huge mess because the economy is straining against maximum debt levels and a huge bounce-back recovery a la 2008-2009 is not going to work this time. So there you go. Prepare for some trouble. Hold cash. A Billion Barrels of Bakken Oil: So What? Wow, sounds impressive. But how impressive is it really? The world consumes 87 million barrels of oil per day. A billion barrels of oil is merely 11.5 days worth of global oil consumption. In comparison, Alberta produces about 2.1 million barrels per day. That’s roughly a billion barrels every 16 months. A billion barrels is just a drop in the bucket of world oil consumption, especially when you’re talking about production since 2005 and the oil is extremely challenging to actually get out of the earth. The European Union is falling apart. It is desperate for money. The bureaucrats in Brussels will tax anything they can. Now the EU wants to modify its fuel quality directives, so that refiners who use oil that is “too dirty” (according to bureaucrats) must pay a tax. Joe Oliver, the Natural Resource Minister of Canada, thinks this amounts to specifically targeted tax on Canadian oil-sands product. He says Canada will sue the EU at the World Trade Organization if they implement the changes, because the oil-sands crude isn’t any “dirtier” than many other crude imports which are not subject to the tax. Firstly, let me note the hypocrisy when an official from Harper’s government whines about tariffs, while Harper’s government loves tariffs. “Oh yeah, taxing our stuff is bad; taxing your stuff is okay.” Typical government knavery. On a more general level, yes the EU fuel quality directives and its associated penalties are bad for the economy. They are bad for Europe and bad for Canada. They reduce production of the taxed good and divert resources to government approved fuels. The government is in principle incapable of knowing to what extent a given quality of oil should be used. Oil sands production is “dirty”, sure. The industry has a lot of flaws. Really, the CO2 emissions aren’t even a big deal, although that’s what everyone focuses on. But the environmental situation is still very screwed up, because Alberta is essentially a mini-petro-state. Property rights and laws of tort can rarely protect the environment because virtually all the pollution takes place on government land. Even so, that is true of most oil. There is very little “clean” oil where you just turn on the tap and get light, sweet, succulent crude with minimal impact on the earth. Most of it is heavy and sour and difficult to get. Due to inept government regulation and interference with property rights, its production is environmentally problematic. So the European tax seems to be not just destructive, but arbitrary. If the WTO agrees with Canada that the fuel directives constitutes an unjustified tax, they can’t force them to change it. It just means the Canadian government can put their own tariffs up to retaliate. That is bad for everyone. It would be better to just accept one dumb tax over which one has no controlnthan implement another dumb tax to go along with it. If the Canadian oil producer finds it harder to sell its oil, that’s already bad enough. Why should the Canadian consumer also be punished? It makes no sense, and only a politician or a shyster would advocate this.